Overview: Miao and Hmong are two terms used to refer to an indigenous people of southwestern China. 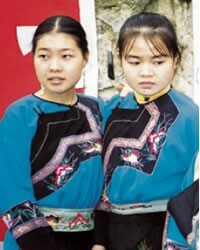 The Miao live mainly in the provinces of Guizhou, Hunan, Yunnan, Sichuan, Guangxi and Hubei. Miao is a Chinese term that is widely used but does not reflect the self-designation of all the peoples within this cluster, many of whom prefer Hmong or Hmu. Some sub-groups, most notably the Hmong, have migrated out of China into southeast Asia and are today found in Thailand, Laos, Vietnam and Myanmar. Following the Communist takeover of Laos in 1975, a large number of Hmong refugees resettled in the United States, France and Australia. Most of the people groups represented by the Miao / Hmong people cluster practice various ethnic religions.